A leading cleric in Iran has called for unity over the consideration of the July 14 nuclear deal with the 5+1 Powers. 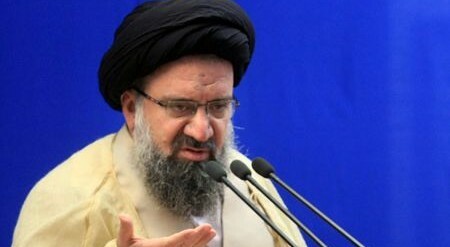 Ayatollah Ahmad Khatami, a Tehran Friday Prayer Leader and member of the Assembly of Experts, appealed for “unanimity on national interests” on Thursday. He assured that the Supreme Leader and government officials will only accept a “good deal” with the 5+1. Tensions have arisen over the procedure for approval of the deal. Hardline MPs, including those linked to former President Mahmoud Ahmadinejad, have insisted that Parliament should be able to vote on the agreement. The Government says that Parliament can give an advisory opinion, but that approval rests with the Supreme National Security Council. Earlier this week, the dispute led to angry scenes between MPs and Speaker of Parliament Larijani, when the hardliners said that “the dog of Ahamdinejad and [Ahmadinejad’s former advisor Esfandiar Rahim] Mashaei have more dignity” than the Speaker. Rumors are circulating that some of Ahmadinejad’s former advisors are being threatened with arrest, in an attempt to blunt the criticism of the handling of the nuclear deal. PreviousSyria Daily, July 31: Did the US Abandon Its 54 Trained Rebels?